A virtual machine image, referred to in this document simply as an image, is a single file that contains a virtual disk that has a bootable operating system installed on it. Images are used to create virtual machine instances within the cloud. 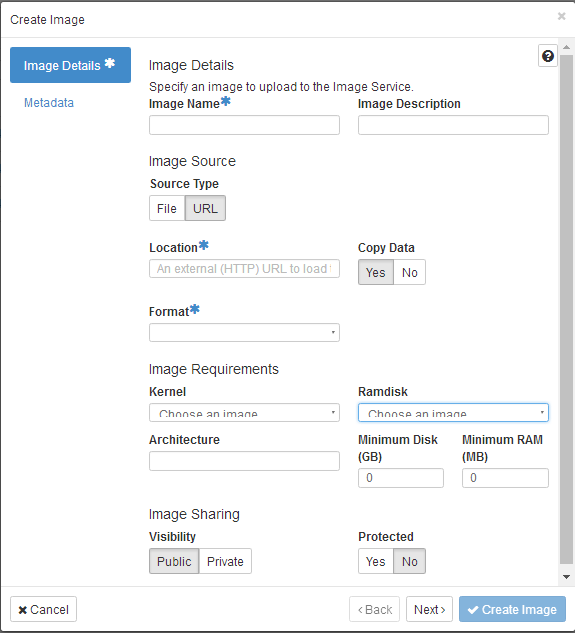 For information about creating image files, see the OpenStack Virtual Machine Image Guide. Depending on your role, you may have permission to upload and manage virtual machine images. Operators might restrict the upload and management of images to cloud administrators or operators only. If you have the appropriate privileges, you can use the dashboard to upload and manage images in the admin project. You can also use the openstack and glance command-line clients or the Image service to manage images. On the Project tab, open the Compute tab and click Images category. The Create An Image dialog box appears. Based on your selection for Image Source, you either enter the location URL of the image in the Image Location field, or browse for the image file on your file system and add it. Select the image format (for example, QCOW2) for the image. The access permission for the image. Public or Private. Select this check box to ensure that only users with permissions can delete the image. Yes or No. The image is queued to be uploaded. It might take some time before the status changes from Queued to Active. In the Actions column, click the menu button and then select Edit Image from the list. Change the description of the image. Change the minimum disk of the image. Change the minimum RAM of the image. Select the Public button to make the image public. Clear the Private button to make the image private. Change the metadata of the image.